Tags: Allyen Jaffrey Schulman, Deborah Giardina, poker hall of fame, women in poker hall of fame. Posted on Friday, May 09, 2014 by "T". 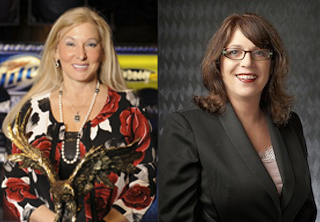 Selected media members, current members of the Women in Poker Hall of Fame (Jennifer Harman, Linda Johnson etc) and Board of Directors have inducted Allyen Jaffrey Schulman and Deborah Giardina into Women in Poker Hall of Fame! They will be honoured at the Golden Nugget's Grand Ballroom (Las Vegas) on June 25, 2014, where a silent auction also will be held. All money raised will go to WhenCharityWorks.org and PokerGives.org. Schulman, wife of 2009 WSOP Europe Main Event winner Barry Shulman and step-mother of 2009 WSOP Main Event final tablist Jeff Shulman, has earned over $1.25 million (61 cashes) in her live poker career - with the biggest cash being a win at the 2012 World Series of Poker Senior's Event (4,128 players) for $603,713! Besides being a good poker player, she has been a board member of the Poker Player Alliance and the WIPHoF, and she's known to be one of the world's leading experts on online gambling law. Deborah Giardina's career in the poker world started 23 years ago in Colorado when she started working as a dealer in a casino. After only six months working as a dealer, she became Assistant Table Games Manager, and after that she became the Cardroom Manager at Lyle Berman's Grand Casino Gulfport in Biloxi, Mississippi. In 1999, she opened the card room for Canterbury Park in Shakopee, Minnesota, and a few years later she became the Director of Poker Operations at the New Wynn Las Vegas Poker Room. As of today, she's the Vice President of Poker Operations at bestbet Jacksonville in Florida. Harman and Juanda Become Poker Hall Of Fame Members! Todd Brunson & Carlos Mortensen Chosen For Poker Hall Of Fame! 9 comments for "Allyen Jaffrey Schulman & Deborah Giardina Inducted Into Women in Poker Hall of Fame"
cool, its always nice to see vice presidents and board members in ... poker hall of fame. i think some legendary poker commentators and chip manufacturers should also get their place in "poker" hall of fame. And not to mention some famous rent a car agencies managers and Ben affleck. I mean hes famous, rich and loves poker, he defo deserves to be in poker hall of fame. But they both seem to be very significant for the poker industry. speaking of which, what this world needs is... Turtles hall of fame. We could have some famous turtles in there, together with people who contributed the most to turtles happnies all over the wolrd, like ... me. iTestify i belong to turtles hall of fame (or THoF short). Not sure about giadina but shullman deserves a spot for sure, lets not forget they are competing in a largely male dominated field, which must be tough. To make over a mill in cashes for anybody is a high achievement. Massive achievement by Schulman at the WSOP, women no doubt can play cards and trust me some are really tough to play against whatever it is online or live. Yeah, winning a 4000 man tournaments is quite an achievement. She had to play good, just luck wouldn´t be enough. This shows once again why the poker game is so great, you can be young or old, women or men, at the poker table you are equal. I think ultimately there really shouldn't be that much of a difference between men and women in poker - if the fields were balanced 50/50 over many years the winners would be fairly evenly spread, it's just a particularly masculine game or tends to attract men at least.